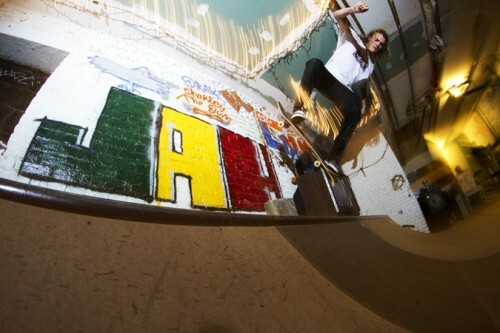 Loose Trucks Max — Blunt stall. Photo by Colin Sussingham. TVs are the first must-have commodity in the impending 2013 “Trip to New York” cycle (slated to begin in April.) With recent studies indicating that Americans watch up to 3 1/2 more hours of TV on computers than on actual televisions, many TVs are ending up in the trash. 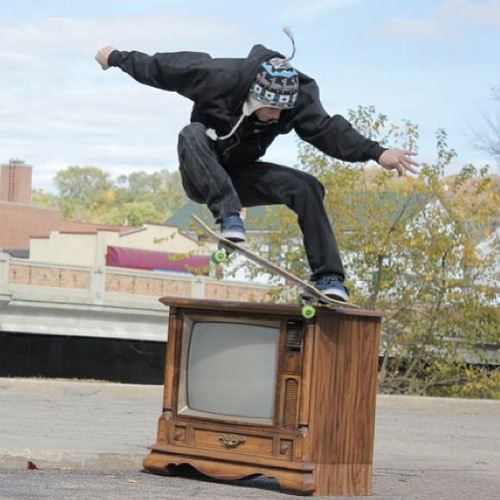 Naturally, northeastern skateboarders who love skating garbage took notice, and TVs began to gain on the refrigerator’s marketshare in the “Most Frequently Skated Household Appliance” category. #Trendwatch2013 analysts expect that tricks on televisions will graduate from mere novelties, to modern-day staples of the “authentic” New York web clip checklist. 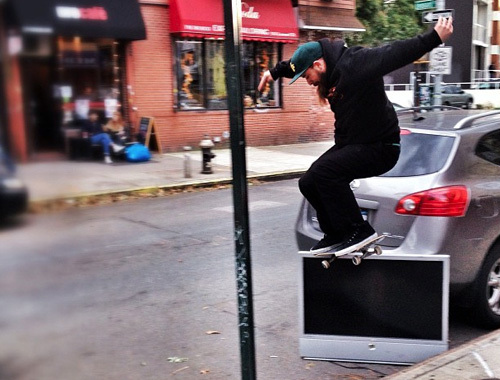 Tricks on abandoned cars and wallrides on porous surfaces (e.g. chain link fences) have also been able to make this leap in recent years. 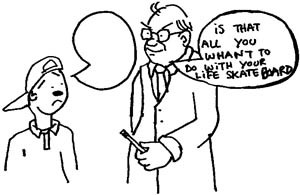 Could this be one giant skaters-go-to-art-school-and-get-crazy-ideas-from-smoking-too-much concoction intended to be a critique of America’s TV addiction? Is it performance art? 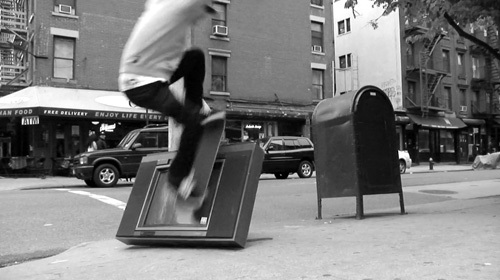 Are we on the brink of scanning Craigslist curb alerts for free TVs instead of thinking about spots to skate before we call our friends on Saturday mornings? Did @SeinfeldToday fall off? 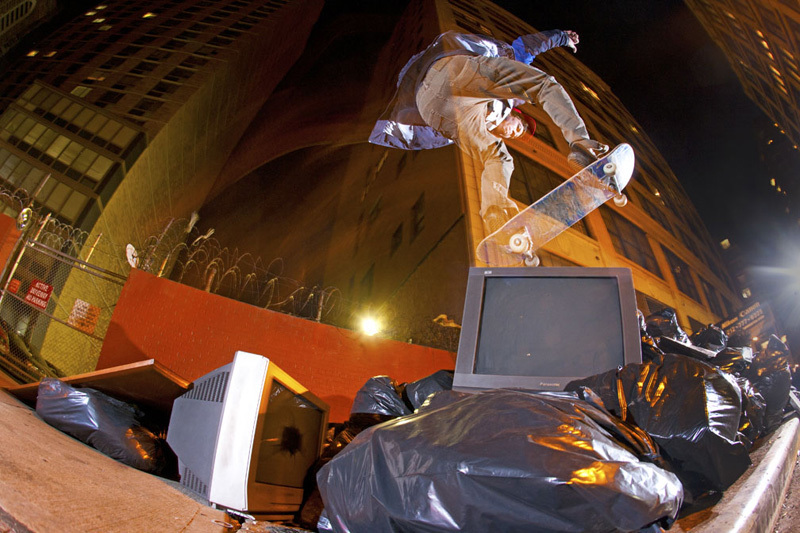 Is there an industrious crew of skaters performance artists intent on making the first-ever all-TV skate clip? And if so, will they consider Kingpin Skinny Pimp, Yo Gotti and 8ball’s bass-heavy masterpiece, “TVs,” for music supervision? Does anyone like Criminal Intent more than SVU? Via rap videos, circa 2002. 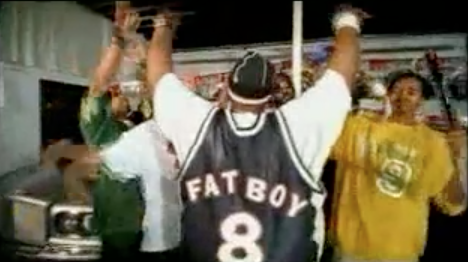 QS will buy any person who submits footage of himself doing a trick on a TV in 8ball’s “Fat Boy” jersey (visible at 3:52) an actual TV. How can anyone like SUV more then Criminal Intent? I only fucks with major cases. No little nickle bag street rips. Although greatest quote from a tv show came from a one Ice T. In front of the 6 year old daughter whose mother was kidnapped, Ice pontificated, “Snake heads be pimpin her out”. Poor Mommie. Always figured the SVU > Criminal Intent consensus was practically unanimous. Case in point: there’s an episode on right now about a 17-year-old kid addicted to hookers who gives gonorrhea to his teacher. Crimonal. Intent Is Whack Af..! !